When it comes to food, you couldn’t find two people more at odds than the two of us. James is a pure carnivore, while Lisa strives to avoid meat almost completely. 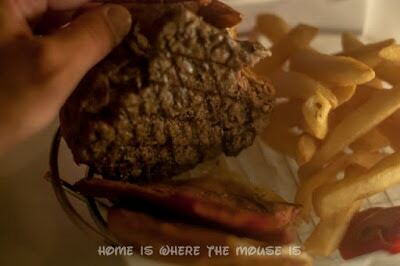 So when it comes to burgers, we often have trouble finding one place that is suitable for both our tastes. At the Sci-Fi Dine-In Theater in Disney’s Hollywood Studios, we stumbled upon a double feature that pleased us both. I love a classic cheeseburger. You don’t have to dress it up as long as it’s good quality meat. If it’s a little on the dry side, I might use some ketchup or barbecue sauce to moisten it up. Add a slice of sharp cheddar and a few slices of bacon to it and I’m in heaven. You also can’t over think the bun. The bun shouldn’t be so hard and huge that you can’t get your teeth around it. At Walt Disney World, I have to say I haven’t found the burgers in general to be very memorable. 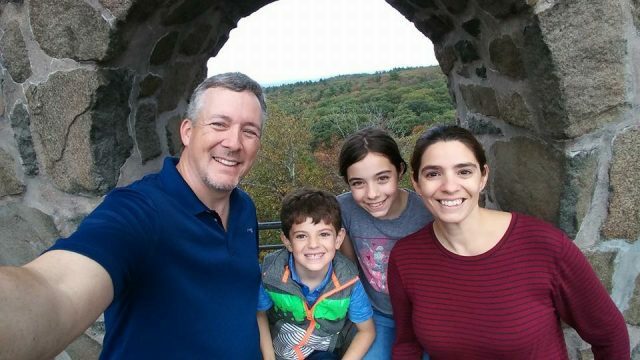 For the most part, they’ve all been pretty much the same anywhere I’ve gone for lunch, and I usually steer away from the burgers at dinner and opt for the steak if it’s an option. 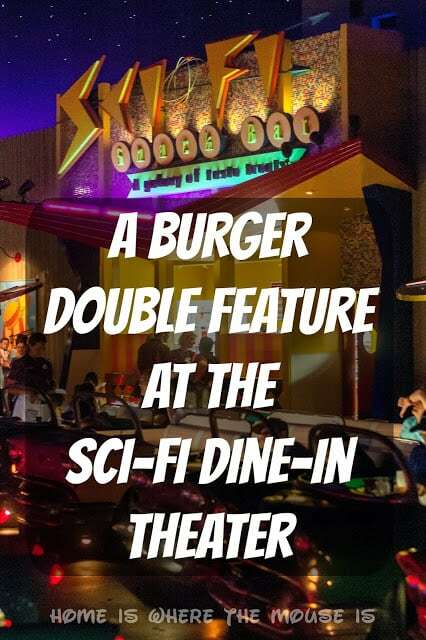 But going into our dinner at the Sci-Fi Dine-In Theater, my taste buds were crying out for a burger or maybe a hot dog to go with the drive-in movie atmosphere. In a twist worthy of dramatic cinema, I was able to get both! 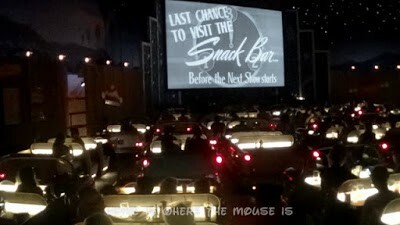 Sci-Fi Dine-In Theater seating is made to look like cars at a drive-in movie. The Famous All-American Picnic Burger gave me the best of both worlds. It put both a burger and hot dog on my bun! It was as if the invading aliens had read my mind and put this on the menu in an effort to distract me from the fact they were taking over our planet. 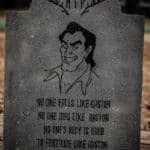 Take a flame-broiled Angus beef patty and top it with a grilled hot dog, sauerkraut, sauteed onions, and a pickle spear. That’s a Picnic Burger. It came with a choice of cucumber salad or french fries. As I said before, I prefer simple. So I complicated my order by asking them to hold the sauerkraut, onions, and pickle. I never put sauerkraut on my hot dog and I absolutely despise pickles. As for the onions, I guess I was just being thorough at that point. I should have asked for cheese. I love both my burgers and my hot dogs with cheese! Grill marks on the beef and the hot dog, which is sliced to lay flat on the bun. It was pure awesomeness. The Famous All-American Picnic Burger was the perfect choice. Paired with fries and milkshake, it made for the perfect meal to enjoy sitting under a starry sky while watching cheesy 50s movie clips on the drive-in screen. It made for one memorable burger. 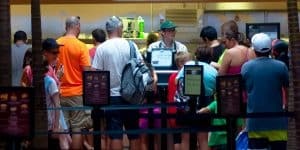 As of right now, the Famous All-American Picnic Burger does not appear to be on the menu at the Sci-Fi Dine-In Theater. They do feature other specialty burgers as a well as a “Build-Your-Own” burger option, which would allow you to get it just how you want. Who knows, perhaps if you ask if it’s possible to get a hot dog as a topping, the aliens will be willing to do so in hopes you will submit to their diabolical scheme. Although I haven’t given up meat altogether, I do stick to a primarily vegetarian diet. 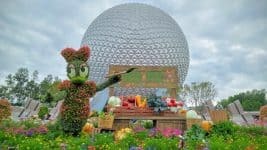 Finding a decent veggie burger at Walt Disney World is like finding a diamond in the rough. Many quick service places don’t offer a vegetarian burger option. The ones that do serve burgers that are either too hard or way too soft. 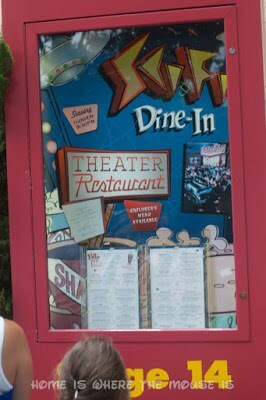 As you can tell, I had low expectations when I chose to order the Vegetarian Burger from Sci-Fi Dine-In Theater. To my surprise, their burger was just what I was looking for. The burger is a black bean and vegetable patty, which is topped with cucumber planks, grilled red onions, arugula and a house-made tomato jam. The combination of black bean AND vegetables made all the difference. 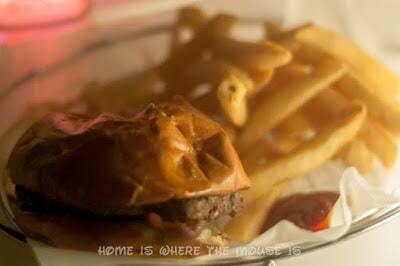 Together they created a well formed and tasty burger that was moist and delicious. It had a nice little kick of spice at the end too! I loved how the onions were grilled to bring out their sweetness. The added crunch from the cucumber was a nice addition. 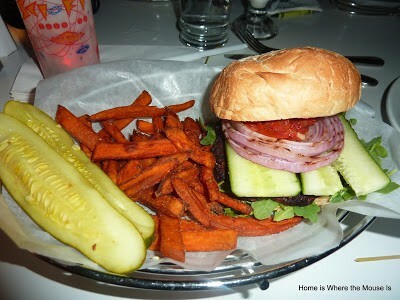 The Vegetarian Burger comes with a choice of sweet potato fries or cucumber salad. Of course there was also a duet of pickle spears on the side. (one could have possibly been James’) For me the best part of Sci-Fi besides the burger was being able to eat at a place where I had more options to choose from other than salad or pasta (they also serve a Vegetarian Shepherd’s Pie). The menu has since changed and their Vegetarian Burger now takes on a Southwest Twist. The Black Bean and Vegetable Patty is topped with a warm House-made Tomato Jam, Arugula, fresh Tomatoes, and Avocado Mayonnaise on a Toasted Bun with choice of Cucumber Salad or Sweet Potato Fries. I was surprised to see it was no longer on the menu, as well. It was something I was looking forward to going back for! I'm in Lisa's camp here. 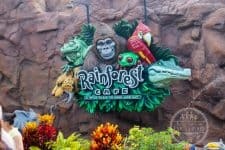 I always go for the veggie burger option at Sci-Fi Dine-In Theater too; black beans always make for a better burger, and that variation is not always easy to find. My kids, on the other hand, are beef aficionados. Although I don't believe they have ever tried the dog/burger combo, they have generally loved their burgers here throughout the years. 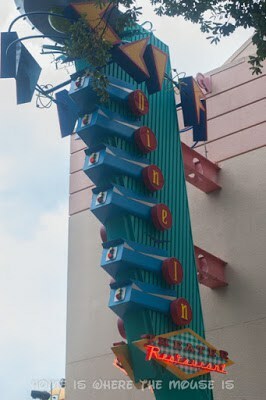 As an aside, we just had breakfast at Sci-Fi Dine-In Theater last week and it was TERRIFIC!! There's Steak and Eggs for James and the vegetarian "Healthy Choice" for Lisa!! yum. steak and eggs is right up my alley! My husband is on James' side. Once he found out that the chef usually has a burger creation of the day we have been back a time or two.